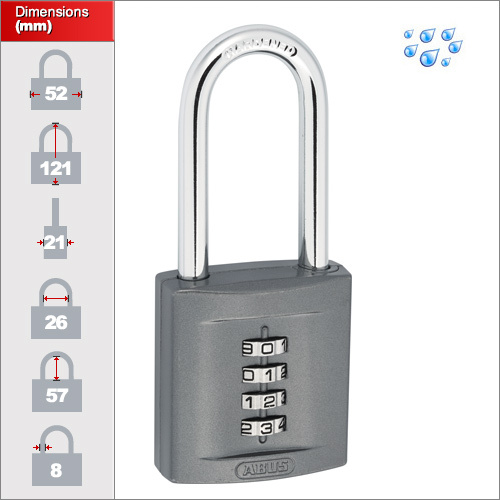 A new long shackled combination padlock, that is weatherproof and has an open shackle design. Add to that a hardened steel shackle and the same die cast metal zinc body used in the rest of the 158 series. The padlock gives you the convenience of a combination padlock and the extra shackle length allows the padlock to be used in some areas where you may have struggled to get a padlock attached before. Such as a gate or set of doors. It is very well made and you can see the expert Abus craftmanship that has gone into making this model. Given this you would expect them to be just as reliable as the rest of the 158 series. 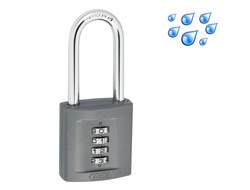 It can be used in normal outdoor environments but if your padlocks will be exposed to sea water or similar conditions we would reccomend taking a look at our range of weather proof padlocks to find a suitable fit for your conditions. It comes in one size only in a solid 50mm version with 4 dials. A possible 10,000 combinations. These padlocks have been designed to be easy to use and it is therefore straight forward to change the combination by anyone that has the original code using the mechanism provided at the base of the padlock. It may be seen by some that this is a little too easy to change the combination. In situations where a few people have access to the code you may prefer a combination padlock with a key to change the combination for added security such as the Abus weather proof combination padlock. This padlock can be used in companies and organisations where there are a large number of people requiring quick access. They are useful where you don't want to give out keys to large numbers of people and it can fit onto those awkward places where you need a longer shackle.